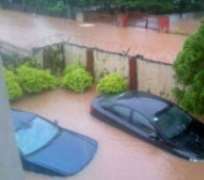 Despite the prosecution of a N30 billion comprehensive Benin City storm water project by the Comrade Governor of Edo State in which he said they have dredge almost fourteen kilometers of a canal,seven meters high by about eight meters wide just enough to convey all the flood water to the river and also submited that they have done about fifty percent of the project which is helpful. It is sardonic to discover that when it rains in Benin, You will need a canoe to enter your house. A lot of people are homeless hopeless and helpless and are now refugees in their state. It must be noted that before the administration of the Comrade Governor we dont experience this kind of River Niger in benin city where you need a canoe to enter your house, one begin to wonder if the 30 billion water storm project is a blessing or a curse? We are using this medium to call on the Governor of Edo state to save the soul of our people in Benin city who cannot sleep with their eyes close because of erosion.